The theme of the day was learning about how to “go green”. We spent the morning at Kibbutz Lotan, a small Kibbutz that is just down the road from Ketura. There, we went on a tour of their eco campus where we learned all about composting and reusing our resources. A highlight of our visit was making bricks out of mud and hay. The kids learned about how we can use the earth and the resources around us in order to build homes and other buildings. At Kibbutz Lotan (almost, if not all of,) their homes are made out of the same material (clay and hay) that we created. In making these clay bricks, the campers got their hands dirty and mixed sand, clay, and water together. Then they shaped the mixture into bricks and put them out in the sun to dry. After, they took already dry bricks and built bridges out of them. The bridges they built were strong enough to bear their weight so they had a lot of fun walking around on the bridges and testing their new creations’ limits. It was amazing to see how well the kids work together in a team when they are working toward a common goal. After mud building, the kids completed their tour by getting to see the homes made of clay and seeing what an ecological bathroom and kitchen looks like. We finished off our time at Lotan with lunch there, and the campers got to experience composting their own food scraps for themselves. On the way back to Ketura, we took a detour and went to Yotvata, Israel’s dairy capital. The kids loved buying their favorite dairy products there and trying the delicious ice cream. 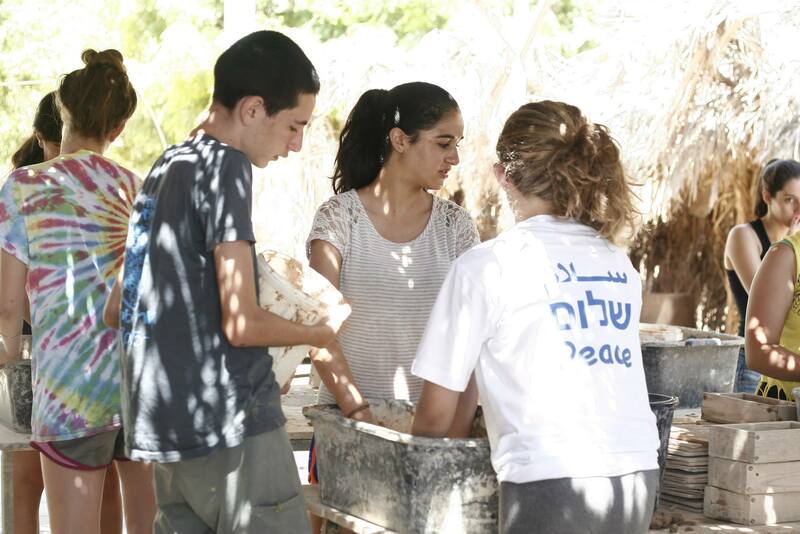 Once we got back, the kids listened to a presentation about the Arava Institute that is hosted here, at Ketura. Learning about the institute really helped them round out their eco experience. Later, they had their movement session with Shuli. For the last night here, we had a barbecue and pool party. The kids loved swimming, dancing, and bonding. We are sad to leave but excited to see what Kids4Peace brings us in the future. The campers can’t wait for Leadership! A very special thank you to the US Consulate General in Jerusalem for making Roots Camp at Ketura possible! The campers are so thankful for their experience this summer.